Here’s a simple recipe for a delicious and super healthy roasted sweet potato side dish. A few weeks back I bought Mark Bittman’s How to Cook Everything Vegetarian cookbook and ever since have been dying to make his chocolate laced meatless chili. I’ve been working on my own vegetarian chili recipe (hope to post it soon), and thought the chocolate in his recipe sounded quite interesting. I made a few modifications to his recipe (using canned beans instead of dry, cocoa powder instead of chocolate, and a few other minor tweaks) and the result was amazing! I would definitely recommend Bittman’s book to anyone who is trying to eat less meat. It’s packed with hundreds of recipes and lots of vegetarian cooking tips – it even has a recipe for homemade tofu (next on my list). As an interesting cross between a salad and a traditional potato side dish, this sweet potato dish proved to be the perfect compliment to the chili. 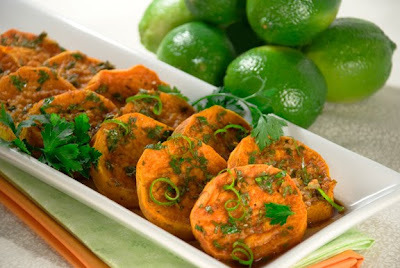 The key here is to pour the spicy lime juice mixture over the sweet potatoes while they’re still hot out of the oven. The potatoes soak up the vinaigrette leaving them sweet and tangy. I imagine this dish would also pair nicely with any kind of slow cooked roast or chicken, and might even have a place at my Thanksgiving table this year. Preheat and oven to 400 degrees. Peel the sweet potatoes and slice ½” thick. Spray a foil lined baking sheet with olive oil. Spread the sweet potato slices onto the baking sheet forming a single layer. Spray the slices with a bit of olive oil and sprinkle with salt. Bake for 1 hour flipping them once after 30 minutes. Meanwhile, whisk together the remaining ingredients in a small bowl. When the sweet potatoes are done baking arrange them on a serving platter and pour the vinaigrette over top. Delicious hot or cold. Enjoy! This was fantastic. Super yummy! My boyfriend and I made a double recipe in the hopes of having it for a couple days but devoured it in one sitting! Thanks! made it and ate it before i had a chance to share! now in the middle of doing it again with a double batch. maybe there'll be enough for everyone... if they happen to be in the kitchen when it's ready! hands-down my favorite sweet potato recipe (maybe my family's favorite if they ever get a chance to have any). How did I miss this one?! They look absolutely delicious. What a great side dish to make for Thanksgiving! Me again! These were DEEEEE-Licuous! Sandy, Sam and I just had the rest for lunch with our turkey sandwiches. these were the best sweet potatoes that i ever had! i recommend that everyone try this recipe.